At the May 26th meeting of the Greene County Board of Supervisors, Melissa McDaniel, Emergency Services Manager, requested that the Board change their current fiscal policy and allow hers and several other departments to keep any unspent moneys that was budgeted and have those funds directed to a capital fund. In the case of EMS the primary expenditure for this fund currently would be for new communication technology. A similar policy is already in place for the Greene County Schools. McDaniel indicated that the past three Capital Improvement Plans (CIP) have included a request for an Emergency Communication System and have not been funded. The current CIP is being accumulated and will again contain a request for a new system. She further indicated that since she originally submitted the CIP request with a cost of $10.3 million, she has been able to identify cost savings reduce the amount required to $7.5 million for the system. The new system would remedy communication challenges between the sheriff’s department, the fire department and EMS. McDaniel indicated their goal is to have a system that operates at a 95% reliability rate and coverage instead of the 55-75% rates that currently exist in Greene. To give a specific example of the seriousness of the need of the county, she invited Stanardsville’s Assistant Fire Chief Dusty Clay to tell them what happened on April 25th at a fire on Madison Road in the town of Stanardsville. 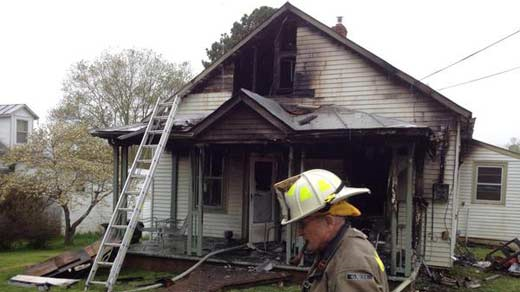 Clay was the first to respond to the house fire and entered the building. He became trapped when a television and dresser fell on him. Twice he tried to use his system to call for help with no success. Only his training as a firefighter, allowed him to calmly try multiple times to free himself finally by using another piece of furniture he was able to pry the dresser off of him and escape. He was treated with first and second degree burns on his back, shoulders and arms. The irony of this situation is that it occurred within the town limits of Stanardsville and the systems in use could not communicate with each other. This was not some distant point on Route 810 – this was in the town of Stanardsville. McDaniel stated that only the training and experience of Clay allowed him to escape the fire with his life and she is fearful that a less trained firefighter would have perished. Supervisor Jim Frydl (Midway District) asked McDaniel if the problem is the device or the antennae? McDaniel said the problem is the whole system which is 15-20 years old and the lack of interconnectivity that the different systems present. Supervisor Davis Lamb (Ruckersville District) asked how long it would take to correct this situation. McDaniel said that from the time it was started to be installed it would probably take near 2.5 years to be completely operational. Supervisor Bill Martin (Stanardsville District) supported the idea of leftover funds going to this project. Frydl stated that while he proposed the school policy of keeping excess funds for capital projects, he believes that this issue should be budgeted. Lamb asked Bart Svoboda, Zoning Administrator, what the status of the CIP is. Svoboda said that it is being assembled and should be to the Planning Commission by July. Lamb suggested that action should be deferred until the CIP is presented so that the Board can prioritize all projects. Frydl agreed with Lamb and cautioned that Greene County will likely have to borrow funds to do this project and can’t afford to pay cash for this size project. It was agreed to defer action on McDaniel’s request until the CIP can be reviewed. What seems out of synch is that the county budget for 2015/2016 has been approved with capital expenditures of only $58,836 (this expenditure is undefined). This has been done without a Capital Improvement Plan completed to see what the county’s needs are and what the cost of those items are. Last year’s CIP had a request of over $5 million for 2014/2015 with a grand total of over $167 million. Brent Wilson is the Greene County Field Officer for the Free Enterprise Forum a privately funded public policy organization. Next The Louisiana “Overlay District” — a Jeffersonian Approach to Property Rights?